Cinematographer and filmmaker Matt Herriger, who hails from Duxbury, Mass., will show his new ski movie, “Winter’s Wind,” at Whiskey Jacques’ restaurant and nightclub in Ketchum on Saturday, Jan. 26, at 5 p.m.
Herriger started skiing at age 4 and fell in love with the sport quickly. A 1988 graduate from the University of Rhode Island, Herriger began ski-bumming at Squaw Valley, Calif., almost immediately after graduation, finally resolving a childhood wish and a question wondering why his family did not live in a ski town. From 1993 through 1998, Herriger was on the other side of a camera, being filmed as a North Face-sponsored ski model and free-skiing competitor. 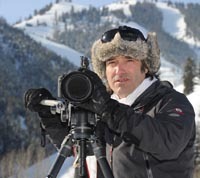 But filmmaker Warren Miller’s cinematographer, Tom Day, thought Herriger was more of an artist and would have a longer career in the business as a cinematographer. In 1998, Herriger bought a Bolex 16 mm film camera and started shooting for North Face. In 1999, after Wyoming-based Teton Gravity Research sent him 10 rolls of film and requested a pay rate, Herriger started shooting film of the best skiers in Squaw Valley for the ski movie company. He moved to Jackson Hole, Wyo., in 2001 and started shooting skiers Micah Black and other local pros, getting his foot farther into the door with Teton Gravity Research. Black and company founder Steve Jones liked Herriger’s style and declared that he was their camera guy. The year 2002 witnessed Herriger shooting ski movies in places such as Andorra and Chamonix, France. He became the “Euro guy” for Teton Gravity Research. Then it was off to Argentina. Herriger felt that ski movies were lacking in lifestyle material. Where were the pickup trucks, the skiers’ dogs, pond skimming and the overall journey and the behind-the-scenes characters? The music was redundant and the locals were missing. Herriger said he and his skiers felt they should take up the culture that they were visiting and bring it to the movies. “I’m happy I made this film because I needed to lay down my folky Bob Dylan,” Herriger said. The movie’s story line traces a 7-year-old kid who meets a ski bum on a ski lift at Sugarbush, Vt. The ski bum tells the kid that life consists of two things: skiing and waiting to ski. The kid replies that in that case, he must be a ski bum, too. Five actors portray the same character at different ages along his journey: Alex Krylov, at age 7, Mike Wilson, at age 22, Dash Longe, at age 27, Micah Black, at age 35, Gary Bingham, at age 60, and Ralph DesLauriers, at age 75. Scot Schmidt plays the guru and Dean Decas plays the ski bum. Entry to the screening costs $10, including a raffle, door prizes and drink specials. The filmmaker will attend and answer questions.